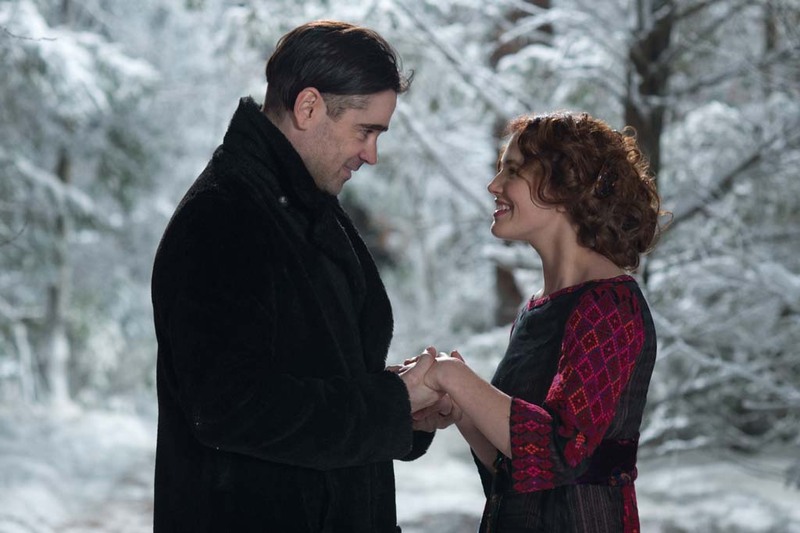 “Winter’s Tale” sports elegant visuals and has its beautiful moments, but its thematically overstuffed romance, due in no small part to underdeveloped supernatural aspects and several cases of miscasting, falls short of a tale worth telling. Burglar Peter Lake (Colin Farrell) never expected to fall for a dying woman, whose house he happens to be burgling. Though he’s taken by the woman, played by Jessica Brown Findlay. A star-crossed- style of romance forms between them, only to be made more difficult when Peter is hunted down by his former mentor and demonic gangster Pearly Soames (Russell Crowe). The forces of darkness threaten to destroy Peter’s love for Beverly, and he desperately tries to save the only woman he’s ever cherished. In a sort of supernatural sweep of events, Peter awakens in modern day Manhattan without his past memories, only to come across a photo of the woman he loved. The photo compels him to embark on a quest to find out why his true love is no longer with him. Screenwriter Akiva Goldsman (“A Beautiful Mind”) offers plenty of visual panache to behold in his directorial debut; the naturalistic beauty is most apparent in the vast upstate New York landscape during the turn of the 20th century, wherein Peter and Beverly’s romance takes shape. After all, you can’t have lovers without the ambiance to bring them together. I will admit that I was, at times, intrigued by the somewhat adequate chemistry between the male and female leads, whether it involved them taking a stroll through the wintry grove or consummating their feelings. However, I do think it could’ve been more believable had the film been anchored by a male lead other than Farrell, as he didn’t quite fit his character well enough. But how does this romance not take off as fully as it should have? Well, for starters, when you have too much weighty material — incarnation, true love, miracles — hurling toward you at once, it can be difficult to digest all that food for thought in one sitting. “Winter’s Tale” doesn’t concern itself with serving its themes to the audience in bite-sized portions; instead, it shoves everything into one big pile that can’t be swallowed. I also believe that the supernatural elements, particularly the otherworldly lights, demons and a white horse guardian called Athansor, were poorly developed. Much of the elements here coming off as vague and, at their worst, unnatural. Sure, they sounded and looked cool, yet ceased to truly belong to the world in which they inhabited. But that’s not all. The story loses a sizeable amount of steam when making the transition from the 20th to the 21st century. Whatever emotion existed in the first half of the movie diminishes in the second half, leaving us to wonder if the movie had already run its course long before the credits appeared. Although Colin Farrell does what he can, it becomes very obvious as the film proceeds that he was miscast. As tried and true as he is, he doesn’t quite fit the role of Peter Lake here, no matter how earnest his attempts to embody the character might be. In contrast, Jessica Brown Findlay is the only cast member who is a natural fit for the character Beverly. She has this classy sensuality about her that imbues the film with a stylish serenity whenever she emerges, which also helps to elucidate some of the better dialogue moments. Russell Crowe is perfectly content to chew the scenery as the villainous Pearly Soames, whose connection to Peter is cookie-cutter at best, restricted to a pointless mentor vs. protégé scenario. In fact, he seems to be there for the sake of being there; we never learn of the details pertaining to the animosity he displays toward the hero. When all is said and done, I suppose “Winter’s Tale” is sweet enough for a Valentine’s Day outing, yet insufficient to be considered a long-lasting love for the moviegoer’s heart to remember.